There’s no more effective motivator for me than the end of something —-the end of a day, week, month or year. Having an even slightly cleaner slate for moving forward seems to make life suddenly full of new possibilities. 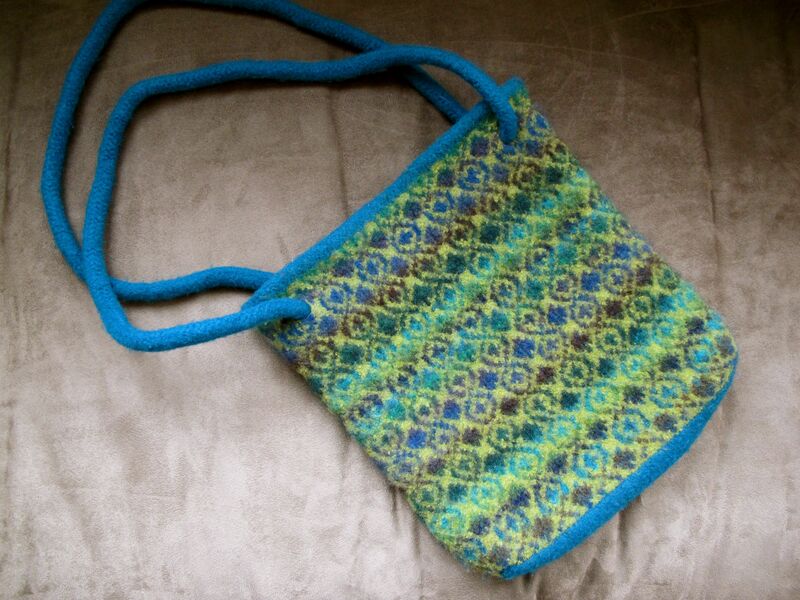 I planned to design a stranded purse: different pattern, different top and bottom and different closure and straps. The swatch went into the swatch box, and the design never happened. During the past few months I kept coming across this particular swatch and last week decided I needed to do something with it–either make something out of it or toss it. I didn’t have any expectations but merely played a bit, telling anyone who asked me what I was knitting that I really didn’t know—which was true. I picked up stitches around the top of the swatch tube and knit a number of garter stitch rows (which I should have counted before felting, right? ), followed by a bit of stockinette (maybe an inch and a half), then a round with a reasonable number of eyelets (*YO, K2tog, k k k k k k k k k –until time to do another eyelet, repeat from * to end of round. Then more stockinette and then a round where I was adding stitches to make the top of whatever this was going to be ruffly. Once I finished that and bound off, I made a 3-stitch I-cord strip from the purple-to-burgundy toned Paintbox handpainted yarn, the darker yarn that was used with the grey heather Cascade 220 in the original swatch Once the top and drawstring (?) were done, I picked up stitches around the bottom and followed worked the bottom similarly to how I’d begun working the top part of the swatch, that is, working an unknown number of garter stitch rows. When it seemed enough I started to gradually decrease the bottom as you begin to shape a hat crown. After a bit of a rounding in, I then decreased rapidly to create a flat bottom. In the midst of all this excitement I decided to finally go out and pick up more pepsid (really!) for our aging dogs. They need it, too. I was startled upon returning to find—or rather not to find—the felted piece where I left it resting on the kitchen counter. I looked everywhere, all the possible places including including the microwave, the dish cupboard, my desk and the refrigerator. Imagine my surprise when I saw it on the entertainment center standing among various art objects (most of which were acquired at Goodwill- As Is for $.29/lb.–with the exception of the piece hanging on the wall by Patrick Horseley, a wonderful Portland Ceramic artist who grew up with my husband in Pasco, Washington.) Terry must have liked it! 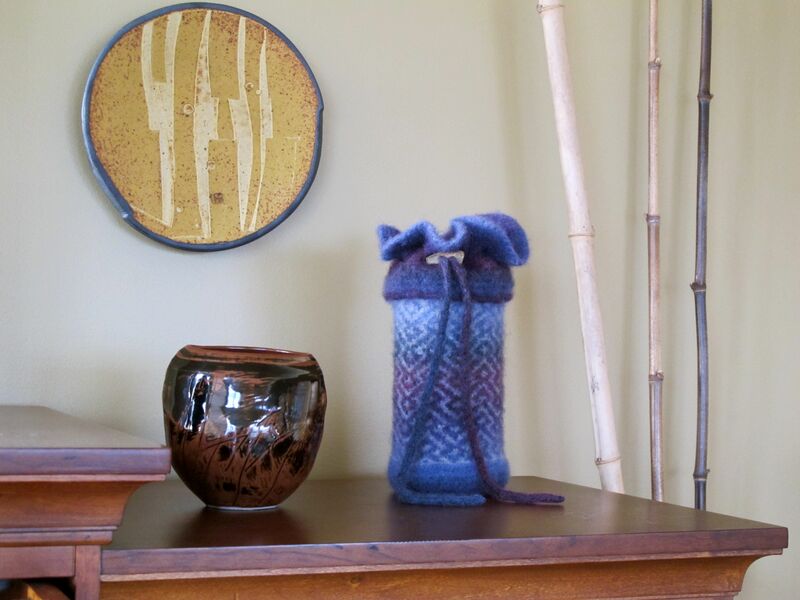 He not only put it in a place of honor while I was gone; he had removed the oatmeal box (he works out every day and is very strong) and inserted a cylindrical pottery vase which fit perfectly! I guess it won’t be a bag after all– at least for now. Making this was just too much fun, and I see more of them coming into my life before long! There’s a lot to be said for playing, but for now, let’s move into the new month and all its possibilities. 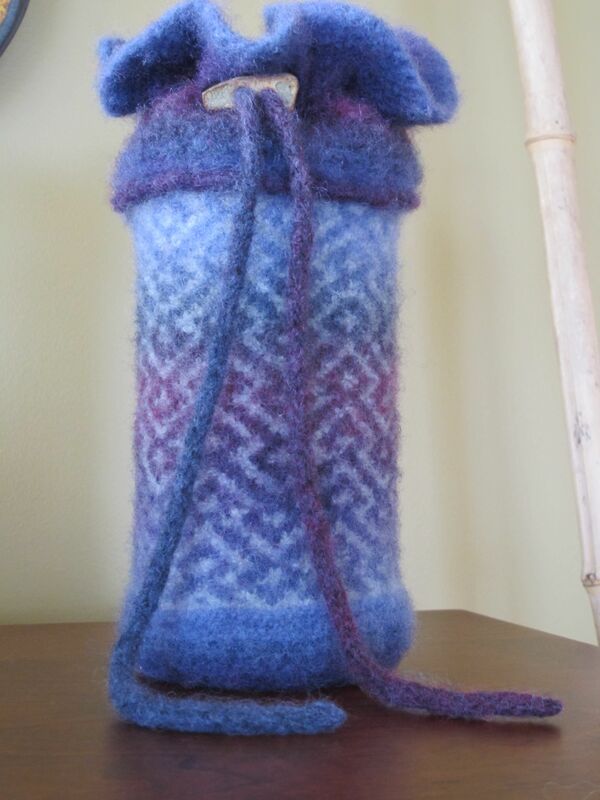 This entry was posted in Friends and family, Knitting, Project Gallery. Bookmark the permalink. I love reading your blog — never miss an entry even though I don’t comment. I couldn’t resist commenting after this entry, though. What a fun project and I love your description of all the problem-solving techniques involved. DH’s placement of the bag as a focal point was the final touch. Somebody really enjoys your knitting! I’m glad that you enjoy the blog and, yes, you’re right. DH seems to be really enjoying all of this. I’m still thinking that someday I want to give him knitting lessons!